Become an Online Millionaire: How marketing and the real world operates. How marketing and the real world operates. While I was digging around in some metaphysical points, I got curious and had to dig up an old post I did years ago. What I was looking for at the time were the mathematical descriptions of action. Just action as a concept. Once you figure out that you are pushing your own purpose forward, you run into very predictable situations. 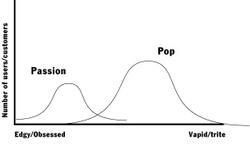 And these are described by the bell curve. And those old posts cover this far more than I need to go into here. T. Harv Eker covers this in his book "Secrets of the Millionaire Mind", where he has a simple diagram which shows that the spiritual, mental, and emotional affect the physical. He laid out that the physical simply reflects the work you do in the other three - much like a print-out (or our own computer screens). If you don't like what's around you, then change your outlook, what you think, how you feel about it. Same thing those teachers in "The Secret" all said. Over and over and over. Success is determined by how little you pay real attention to the universe around you for your motivations, and how much you generate faith in your own creative Self. First, the Everett Rogers Technology Adoption Lifecycle model - shows where sales are happening, as well as utilization of product. And then you plug in the Gartner Hype Cycle, which has more to do with how we market our products to each other and get them into actual use. Now Seth Godin (as part of his book "The Gap") is telling people that there is a similar curve just before this one. And people who drop into the "gap" in between have some major problems. All very interesting data. And of course, you can get fascinated with all this stuff and look all these theories up and so on. However, you can also easily drop-kick all of this with simple Silva-Levenson work. But it's an interesting set of observations about how the "real world" tends to operate. A shorter approach: "Ignore the world around you and Create a new one." And even shorter: "Just Be."